The state of South Carolina enforces wage garnishment laws that are among the most restrictive in the nation. A private party cannot enforce a judgment on a debtor in the state by garnishing, or attaching, wages -- a process that is available only to public agencies such as the Internal Revenue Service. Federal law applied in South Carolina also limits the amount a creditor may withhold from your paycheck. If you owe money to a bank, mortgage lender or credit card company, you are carrying private party consumer debt. Falling behind on payments can bring threats of legal action from the creditor, often beginning with friendly notices, continuing with unpleasant phone calls and ending with a day in court as the defendant in a civil lawsuit. A federal law known as Title III of the Consumer Credit Protection Act limits the amount of money that can be garnished from your wages: the lesser of 25 percent of your net earnings or the amount exceeding 30 times the federal minimum wage, which is $7.25 an hour, as of 2012. The states have a constitutional right to pass their own laws regarding loans, consumer debt and other financial matters. In South Carolina, the state wage garnishment law is even more restrictive than the federal law: private lenders may not garnish wages at all for outstanding consumer debt, installment loans and the like. The law even applies to judgments won in the state's courts. But, if a resident of South Carolina moved from another state in which there is a valid judgment against him, South Carolina law allows wage garnishment to satisfy that judgment. Of course, even the threat of wage garnishment is an unpleasant experience for both employee and employer. If you hear a wrongful or untruthful statement from a debt collector regarding wage garnishment, you can take legal action for violation of federal and state laws regarding collections. 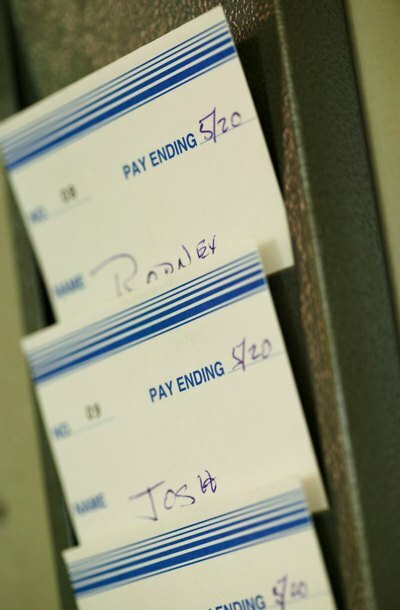 South Carolina law bars employers from terminating employees for garnishment, and a similar federal law protects anyone subject to a single wage garnishment -- although not multiple garnishments -- from termination. You may be considering filing for bankruptcy if your indebtedness is so severe that your wages are being garnished by your employer before you receive your pay. If you are eligible to file for Chapter 13 bankruptcy, you may be able to stop wage garnishment and setup a court-supervised payment plan to enable you to emerge from debt. What Happens If You Get Behind on Child Support Payments? If you've lost your job or suffered a financial catastrophe, chances are that you're barely able to make your child support payments. You might even have fallen behind on them. Unlike credit card and car payments, paying child support is a legal obligation backed by court order. While each state has its own child support enforcement methods, many of the penalties imposed for falling behind on payments are similar from state to state. What Is the Law Regarding Multiple Wage Garnishments in Illinois?